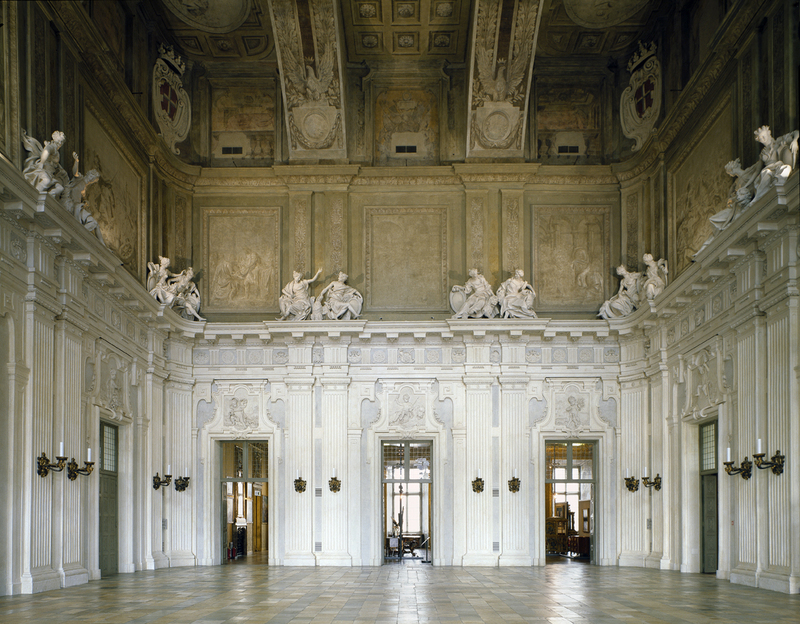 Turin’s Palazzo Madama hosted the first Italian Senate during the 19th Century. In honor of the 150 year anniversary of the Unification of Italy, Fondazione Torino Musei commissioned VR&MMP to realize a multimedia installation recreating the original Italian Senate experience. We were honored to lead the production of this patriotic installation, drawn to the idea of giving new birth to a place that hosted important decisions for our Country. I proposed the use of sound as the main design element: with clever design I knew we could give a multi-dimensional atmosphere and stay within their production’s budget. The idea of an audio-based recreation was accepted with great enthusiasm. My goal was to extract the essence of the lived experience, I wanted each person standing in our installation to feel like they were standing in an echo of the original room, listening to the Italian Senators making important decisions for our country as they did right here in Turin from 1848 to 1861. In fact, this places our audience exactly where the Italian public would have been, able to listen and watch the Senate discussions, but not able to vocally participate. 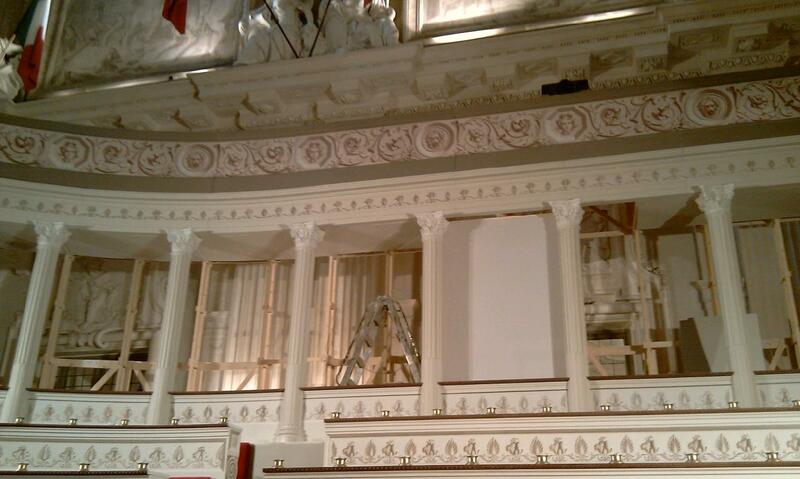 The original room contained a structure designed by Ernest Melano and was organized like this: the lower part of the gallery hosted Senators (authorities, deputies, diplomatics, judges, etc. ), while the upper ring was dedicated to the public who wanted to assist. Citizens were allowed to participate in the sessions without the right to speak, although it has been documented that during several debates the public reacted. I wanted this design to give our audience the ability to identify with the point of view of the Italian citizens. Today, visitors can choose their position to enjoy the show, taking a seat on the marvelous set made by Teatro Regio di Torino. Sound, with its non-invasive nature, is the main actor for this installation but remains a vehicle for transporting us back in time, a strong presence that operates like a recollection of something, a memory. Fifteen actors – directed by Roberto Mare – gave their voices to the Senators, meeting the philological needs imposed by the production. For the public, we decided to give them a small suggestion, a reference to the actual citizens, how they looked and dressed and moved, with video. We filmed real actors in a theatre and used projectors and four screens to present them in the actual room. The below images illustrate the multi media flow: the video projections of our filmed actors had an accompanying audio flow in addition to the main audio flow of the Senators’ debates. In order to find the right position for all the technologies necessary for the show, we used MESH, a pre-visualization software developed by ASA-Lab. Starting from the original AutoCAD file of the room, we first realized a 3D model that we used as reference to find solutions for the placement of our technology. The use of the MESH software during pre-production sessions also made communication easier between the tech team, producers and management, helping us in anticipating potential problems. While we were defining the positions of loudspeakers in the room, the Teatro Regio was building the structure, based on original maps by Ernest Melano. The need of hiding loudspeakers together with the high performance required for the occasion was met by the Meyersound MM4-XP, proposed by Piero Raucci, sound engineer for the show. 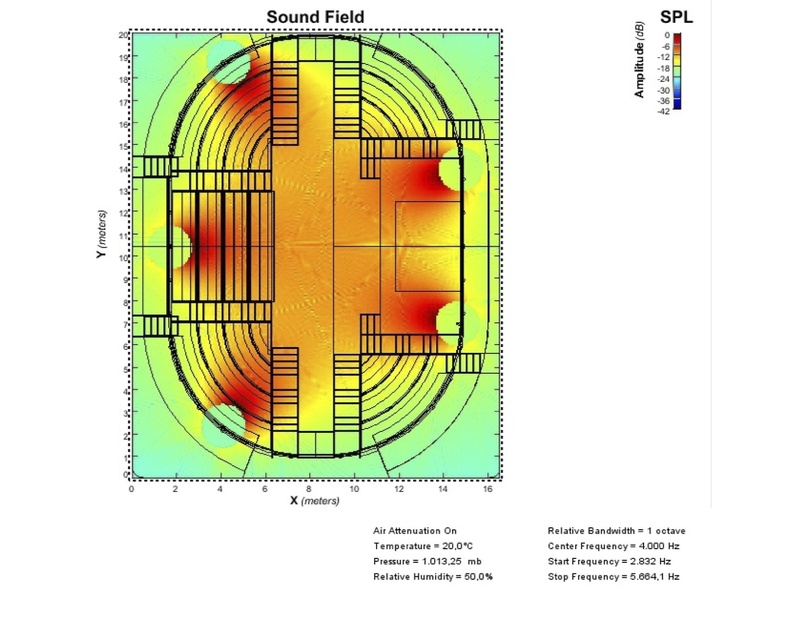 As the image below shows, the field coverage map, rendered through Meyersound Mapp software, mainly covered the area where visitors may have taken seat. We finally decided to use two loudspeakers for the front and three for the rear (reversing the tipical 5.1 positioning) in order to reinforce the area where we had the four screen projections – an important detail of the show, which required more precise sound positioning. Once inside the room for technology installation, Piero used Meyerosound SIM 3 for EQ’ing, inserting some delays and adjusting phases between speakers. We made the first recording tests in a big studio, here at Lumiq, using three microphones in-axis at different distances for depth of fields. The result was successful, but when we played the recordings in the actual Senate room, out of focus voices were unintelligible because of room acoustics. The marble used for the building, whose absorption coefficient is 0.2 at 2KHz and 0.2 at 4KHz, where 0 is full reflection, combined with the large dimensions of the room, drastically altered our recordings. We finally decided to record voices in our vocal booth, asking actors to move their heads while they were acting (like orators do), creating a nice effect of in-focus / out-of-focus that gives an incredible effect of reality on-site. We also recorded actors in small groups, both for wallas and for other Senators reactions building a library of 50 different combinations of positive and negative comments. Historians working on the project gave us valuable descriptions of Senators present in the room from 1848 to 1861, so that we were able to define a series of items they might have been wearing. With these, we recorded the movement of clothes, standing and sitting, and other detailed sounds that would bring our audience into the present moments of this past experience. The sound was cut by Marco Montano, a talented young sound editor here in Turin. He created session templates (vital considering the 13 episodes), edited voices and foleys and prepared sessions for the mix. Of course, always considering the philological relationship that we needed to maintain over all the episodes. There he inserted the other Senators and public reactions, also defining dynamics between stems. Mix was particularly challenging considering several factors – especially because the dimensions of our studio were more than 10 times smaller than the actual room. That’s why we decided to record the impulse response of the Senate room to use as a reference during the mixing session (as a sort of pre-auralization). Very far from science, really useful for the final result. Before bringing our mixes in the Senate room, we organized a listening session with the 5 Meyersound MM-4 and the USW-1P, in order to fully understand how our mixes would sound with this system. This project challenged me as a both a creative artist and a technician. Although we worked considering the room acoustics, we found it was impossible to define a set of procedural rules that would guarantee the sound we wanted from our mix. It was only with the combination of instinct and science that we finally got the results we envisioned. The exhibit is hosted by Palazzo Madama and runs from the 16th March 2011 until the 8th of January 2012.